WASHINGTON, D.C. April 22, 2010 -- The National Association of Black Journalists named CNN's Soledad O'Brien Journalist of the Year at its spring Board of Directors meeting. O'Brien will join other top honorees at the association's Salute to Excellence Gala, on July 31 in San Diego, during NABJ's 35th Annual Convention and Career Fair, the largest gathering of minority journalists in the country. O'Brien is the impetus of CNN's acclaimed "In America" franchise, which began with CNN's "Black In America" in 2008,a groundbreaking documentary, which took an in-depth look at the challenges confronting blacks in America. 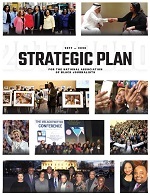 In 2009 CNN followed up with "Black In America 2," a project which didn't just seek to highlight challenges, but also acknowledged the efforts by those in the community to come up with proven solutions to the most pressing issues facing the black community. "Black In America 2" was the highest-rated cable news documentary of 2009, sparking conversations and town hall gatherings across the country to further examine the intersection of race, class and gender, subjects that can be challenging for the media to explore. "Soledad's work in the ‘Black in America' series offered extraordinary and gripping stories of successful community leaders who are improving the lives of African-Americans," said NABJ President Kathy Y. Times. "This was an example of great reporting, and through her work and platform she shared the stories in our communities that often go untold. 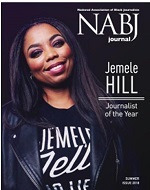 She is truly worthy of NABJ's Journalist of the Year honor." O'Brien crisscrossed the U.S. and included reporting from Ghana and South Africa as she uncovered the people and programs at the forefront of change – people inspiring volunteerism, programs that are improving access to quality healthcare and education, and leaders working to address financial disparities and develop strong families. "Soledad is a solid journalist with a long list of accomplishments," said Bob Butler, NABJ Vice-President of Broadcast. "Her reporting is always done with great thought and perspective. We are proud to have her in the NABJ family." O'Brien is currently an anchor and special correspondent for CNN. She joined the network in July 2003 as the co-anchor of the network's flagship morning program, "American Morning," and distinguished herself by reporting from the scene on the transformational stories that broke on her watch, including Hurricane Katrina and the tsunami in Southeast Asia. During CNN's Katrina coverage, O'Brien's reports on the storm's impact included an in-depth interview with former FEMA chief Michael Brown. She also covers political news as part of CNN's "Best Political Team on Television." Earlier, O'Brien spent 12 years at NBC News where she anchored Weekend Today, and was one of the original anchors of MSNBC. The Salute to Excellence Awards Gala recognizes journalism that best covered the black experience or addressed issues affecting the worldwide black community during 2009. NABJ's 35th Annual Convention and Career Fair will take place July 28- August 1 in San Diego, Calif. For additional information, ticket sales, registration, please visit us at www.nabj.org.